We got there early to see the pilots and their crew set up their balloons. The first balloon inflated was advertising the event's sponsor. There were frequent warnings NOT to smoke around the balloons. It was impressive to see the balloons airing up. Here, you can see about 2/3's the way down one of the lines. There were two lines of balloons. To air up the balloons, a crew would use fans to partially inflate them. Once the balloons were about 60-70% inflated, they would fire up the burners. The flame from the burners was actually much larger than what you see here. 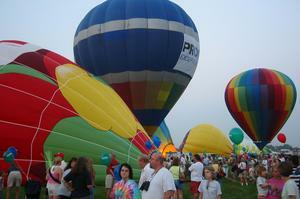 If you're interested in seeing a 'glow' or a race, check out the upcoming events for the Montgolfier Society of Indiana. They are the state's (only?) hot air balloon club.